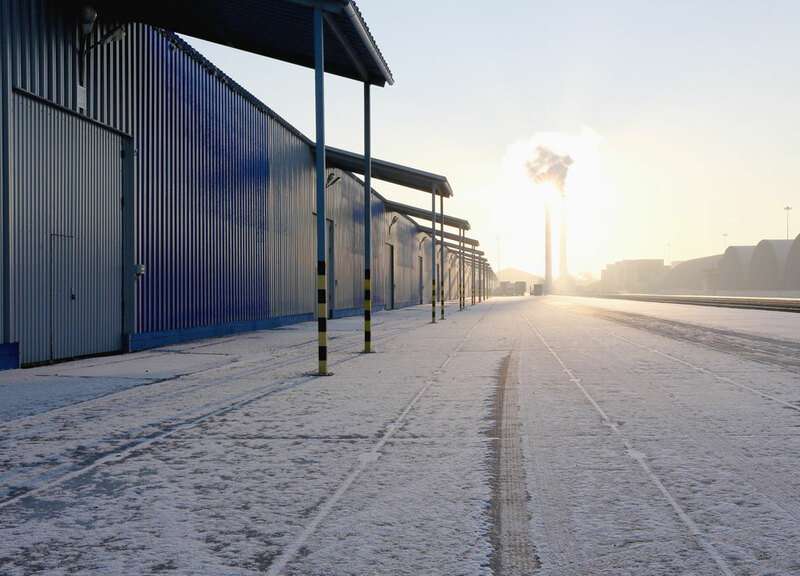 Operating from a warehouse, garage, factory space and other indoor or outdoor industrial sites during the colder months of the year requires powerful heating equipment for high operational efficiency. When searching for the best option for an industrial heater the most important elements to look for in a unit are always safety, efficiency, and effectiveness. Precision Equipment manufactures all of our industrial and commercial heaters to provide the highest BTU per hour performance while also incorporating features that ensure the safety of the operator and the longevity of the indirect heating machine. Industrial heaters work well for a wide range of applications such as assembly rooms, hangars, and inside other enclosed commercial areas. They also function well in outdoor industrial applications that require a tremendous amount of heat during arctic conditions. At Precision Equipment, our flameless heat technology offers a revolutionary way to heat any work space without the risk of utilizing an open flame, without the excessive moisture and humidity produced by other types of heater as well as none of the harmful emissions that many heating systems can produce. We offer units that work as commercial portable heaters, industrial warehouse heaters that are fixed, industrial temporary heater options as well as commercial warehouse heaters that are used on a permanent basis. Our portable commercial heaters have the distinct advantage of being able to easily move from place to place in and around the main work area. This offers you more flexibility and options when compared to other industrial warehouse heaters that are exclusively fixed. Precision Equipment industrial heaters primarily keep work spaces warm and dry with low emissions magnetic heat that is humidity-free and highly efficient. However, our heaters also have many other practical applications for industrial and commercial use. Pipe Freeze Protection - Prevent pipes from freezing and being damaged as a result of harsh winter conditions. Humidity Control – Heaters effectively control the level of humidity in an industrial workspace and can prevent the growth of mold and bacteria. Tank Thawing – Return solidified and frozen tank contents to a fluid state quickly and efficiently. Air Drying – Quickly dry out the moisture from a workspace by using one or more heaters to evaporate excessive liquids. Heating Liquids and Other Substances – Depending on the industry, heaters can be used to raise the temperature of various substances to make them usable in the manufacturing and operations process. We believe that an industrial heater should be as easy to use and operate as it is efficient. This belief is reflected in several of the design features of the commercial heaters manufactured by Precision Equipment. Digital Temperature Control - Set specific temperature levels based on the current use of the heater. This feature also allows for higher fuel conservation and enhanced safety while operating the heater. SAE J1939 Engine CAN Bus Communications – Industry standard CAN Bus communications engine for simple operation and diagnostics. Simple Control Panel – Set up and operate the heater quickly and easily with a simple and intuitive digital control panel. At Precision Equipment our client’s health and safety is a top priority and our industrial and commercial heaters are designed and manufactured to reflect these values. Flameless Operation - Our industrial heaters feature flameless technology to generate the precise amount of heat needed in extremely cold working conditions. The no flame operation of our heaters helps to prevent common operational issues that stem from using an easily combustible machine during work projects. Emergency Stop Button – Quickly turn off the heater whenever necessary with the conveniently located emergency shut off button. Circuit Overload Protection – Built-in circuit overload protection automatically prevents your heating unit’s electrical systems from being damaged if there is an unexpected circuit overload during operation. High Temperature Shutdown – Designed to shut off automatically if the machine goes over a pre-specified temperature during regular operation, this feature reduces the likelihood of irreparable damage and equipment failure. Fluid Level Shutdown – Precision Equipment’s industrial heaters shut down automatically when fluid levels fall below optimal. This helps to preserve the health and integrity of the heater engine which prolongs the useful life of the unit. Pressure Sensor Shutdown – If pressure builds beyond operable levels, a sensor automatically shuts the unit down, preventing the risk of an explosion. In addition to the control and safety features of our industrial and commercial heaters, the units designed by Precision Equipment also carry the following practical and efficient features. Large Service Access Doors - When service and maintenance need to be done, the large access doors provide a fast and easy way to get to the heater’s engine and other mechanical and electrical components. Blinking LED Indicator – A blinking LED indicator located on the roof of our heater lets you quickly and easily ascertain the current operating condition of the unit at any point in time. Full Secondary Containment – All of our heaters feature full secondary containment to prevent spillage in case of fuel tank overfill. 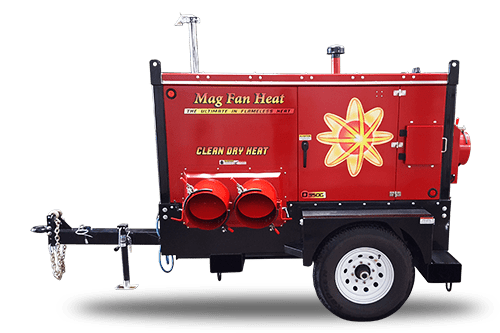 With an operating efficiency of over 90 percent, Precision Equipment offers industry leading fixed and portable industrial and commercial heaters that are easy to use, simple to maintain and built to provide years of reliable heating.